We are the only program in North America that meets all teacher licensure requirements and supports international teachers to earn a full Virginia Postgraduate Professional teacher license from the Commonwealth of Virginia. In the field of education, the job market has no boundaries. 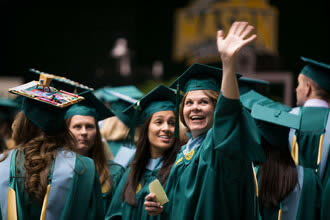 George Mason University has been preparing educators to teach in international environments since 1990. Formerly called FAST TRAIN (Foreign Affairs Spouses Teacher TRAINing Program), Mason continues to offer high quality, convenient, and experience-driven graduate education to international educators worldwide. We also offer generous discounts on in-state & out-of-state tuition through our international education cohorts. Find out what Mason has to offer international educators below. In 1990, the Virginia Department of Education entered into a unique partnership with George Mason University and the U.S. Department of State to provide highly trained, licensed teachers in critical shortage areas in K-12 schools overseas. This initiative, formerly called FAST TRAIN Programs, combines the talents of George Mason University’s faculty with the exceptional requirements and standards for Virginia State’s teacher license, FAST TRAIN has prepared over 1,400 teachers in the past 25 years who not only teach U.S. citizens living overseas but who often return to use their culturally enriched experiences and professional talents to instruct our children in Virginia and other states. Our goal is to develop internationally minded teachers who demonstrate expertise, commitment and understanding by providing quality, effective teacher education programs. We embrace best practices and diversity and prepare teachers for the challenges in global learning communities. We strive to provide a supportive, exceptional learning experience to help teachers earn the credentials they need to succeed in international schools around the world. Now part of the Teaching Culturally and Linguistically Diverse and Exceptional Learners program, our international degree & certificate options are offered in, traditional, intensive summer & online schedules to fit the needs of educators around the world. Some certificate programs run entirely online using an asynchronous format. Students can be anywhere in the world and complete these certificate programs in their entirety. Students concurrently enrolled in M.Ed. programs generally required one intensive summer (or more) to finish the degree. Our International Elementary program offers a unique schedule at our Arlington campus. Courses are offered face-to-face in the evenings, 4:30PM – 7:10PM. Students take two or three courses at a time from the end of August through the end of July each year. After completing seven preparation courses, students typically complete the certificate licensure program in an overseas internship the following year. Students concurrently enrolled in the M.Ed. can typically finish this degree with coursework offered from the end of June to the end of July as part of our intensive summer schedule. At the center of our international program offerings is the intensive summer and online schedule which Mason has run for international cohorts for the last 25 years. Students take courses from the end of June to the end of July in three summer sessions (one course each session). Each course runs Monday – Friday, 8:30AM to 3:20PM for eight (8) days each. Because each course in our program required K-12 application, students are given extended deadlines through the fall & early spring to complete observation, teaching, assessment, and other learning activities with K-12 children around the world as part of fieldwork requirements. In addition to intensive summer courses, these programs offer online coursework in the Fall & Spring semesters, allowing international educators the flexibility to be anywhere in the world and complete their degrees. Celebration of Completion - Friday, July 27th, 3:30PM - 5:00PM - bring your family and guests! Summer courses for students enrolled in the international cohort (ESOL or Elementary) are held each year on the Fairfax Campus for five weeks, from the end of June through the end of July. The five week time period is divided into three sessions and students may participate in one class per session. Each individual class runs for eight business days, Monday-Friday, from 8:30-3:30 each day. Due to the intensive time frame and amount of content covered each day in class, no absences are permitted. You will receive in progress grades (IP) until the PBA and fieldwork deadlines. You are expected to maintain communication with your summer professors by monitoring your Mason email account and notify your advisor and instructor of any outstanding issues you may face during the academic year. Please note - although PBA deadlines for summer classes are staggered throughout the academic year, your official registration is for summer only. You may need to consider how this will affect your financial aid package. * If you are planning to apply for a Spring 2019 internship, you will need to turn in all your summer PBAs by December 15, 2018. This must be arranged via prior permission from your summer professors. Please make arrangements at the start of the summer session so they are aware of your plans. Students in our international certificate programs have the option to complete a M.Ed. in Teaching Culturally and Linguistically Diverse and Exceptional Learners through a schedule convenient for international educators. M.Ed. coursework requires both online & intensive summer courses to complete requirements. Please view our M.Ed. page for more information about this program. Students in our international certificate programs have the option to complete a M.Ed. in a schedule convenient for international educators. The M.Ed. Advanced Studies in Teaching & Learning is designed for practicing teachers who want to develop research-focused and student-centered practices to become teacher-leaders in schools. This program requires 18 credits of coursework beyond the certificate, and includes one intensive summer course with online coursework the following Fall & Spring. The ASTL program has additional admissions and program information.